Legends graced the runway for the star's first fashion show with the brand. "Raise your hand if you get to show your @tommyhilfiger collection in Paris tomorrow night." InStyle just gave the characters some major style points. Copy Kate Middleton's regal blue coat for less -- plus other amazing tour looks! Get the Duchess of Cambridge's best looks for less. We checked in with the makeup artist who swapped out stilettos for sneakers. These were the words of excitement posted on actress, singer and social media influencer Zendaya's Instagram leading up to her iconic debut presentation of the #TOMMYNOW collection, which featured legendary models such as Grace Jones, Pat Cleveland and Beverly Johnson. Raise your hand if you get to show your @tommyhilfiger collection in Paris tomorrow night? During a time when diversity and inclusion have been lagging behind in fashion, the 22-year-old used her platform to showcase a cast of 59 black models ranging from age 18 to 70. "Our show was a celebration and appreciation for all of the iconic women who fearlessly pioneered and opened doors that are the very reason I’m able to exist in this space," Zendaya wrote in an Instagram post. She continued, "So to every woman on that stage and the many others who weren’t, we love you, we see you and we thank you." After surprisingly being called upon by designer Tommy Hilfiger to do the show together in Paris, and touching base with her creative partner and stylist Law Roach, Zendaya was on board. She also had a vision. "I want to make a show inspired by the women who made it possible for me to be in the position where I am now," the 22-year-old "Shake it Up" star told "Elle." "Honestly, I just wanted to say 'thank you' to them through this show. I said to Tommy, 'If we do a show, this is what it needs to be about.' And Tommy said, 'Great. Go for it.' And he actually meant it. I mean, look." 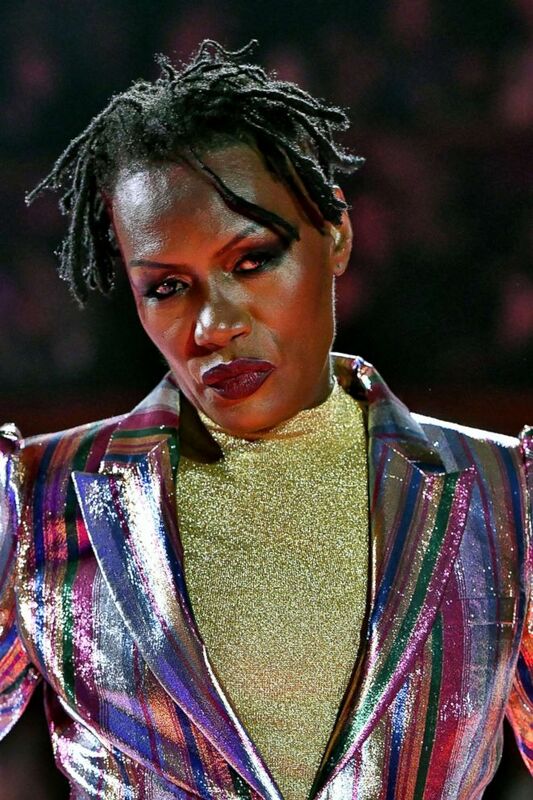 (Victor Virgile/Gamma-Rapho via Getty Images) Grace Jones walks the runway during the Tommy Hilfiger TOMMYNOW Spring/Summer 2019 : TommyXZendaya Premieres at Theatre des Champs-Elysees, March 2, 2019, in Paris. In addition to the aforementioned greats that dominated the show, there were also popular fresh faces such as Winnie Harlow, Jourdan Dunn and Halima Aden who really helped to really make the "Battle of Versailles"-inspired presentation one for the books. The all-black model lineup paraded the show wearing metallics, stripes and shimmer that had a disco flair. It's a collection that Zendaya is proud of -- and many others are, too.